Geometry Waldorf•ish Online Courses that simplify your school year. Bring your homeschool curriculum to the place where art meets math. Registration for our online Waldorf Geometry Lessons is open!. What's included in our geometry curriculum series? Each grade 5-8 has it's own course of 15 lessons each, based on the Waldorf pedagogy. For those in other grades, or using other educational methods, the entire program is a perfect artistic supplement! The content for each course will be delivered all at once. This allows families to decide whether to use the course as a Waldorf-style block, or to spread it out over the school year. In a similar fashion to our other programs, you will be able to access each course even after the school year is over! 3. Gather and order your supplies. *Homeschool group class pricing: please contact us at support@waldorfish.com to discuss special pricing for groups. This pricing is for those wishing to use our lessons in a class they teach locally, within their own community. We do NOT currently offer a group-buy price. *Recommendation: We suggest purchasing at grade level if you've covered the previous grade's topics and your child is confident with them. We suggest purchasing a grade lower if you've covered some of the previous grade's topics and your child would benefit from further practice and review. Example of the main lesson pages your family will create! Along with several videos per lesson, these courses also come with the support of your course teacher in the online classroom AND a closed FB group (G5-8 together) for grown-ups. Using the FB group is not required to participate in the course. Each course will include examples of practice problems, quizzes/review (where relevant), etc. The choice to use them or not is yours. Supply lists for each grade will be included in your welcome email after enrollment. Many of the supplies will overlap from grade 5-8. Will it be mainly Waldorf geometric drawing like the sample lesson, or more like the traditional geometry I remember from public school? Our program is being developed by 2 experienced Waldorf teachers (Brian Wolfe + Caitlin Amajor). Between them they have 18 years experience teaching Geometry. Their approach is inspired and artistic! That said, they will cover much of what you remember (or don't remember, wink wink) from school and SO much more. Once purchased, will I be able to access my courses even after the school year is over? Yes! In a similar fashion to our other programs, you will be able to access each course even after the school year is over. WHAT IS YOUR REFUND POLICY FOR THE WALDORFISH GEOMETRY COURSES? Due to the instant, all-access and digital nature of this course, there are no refunds. Please contact us with questions about this policy. Brian Wolfe has spent his entire adult life playing music, teaching, drawing & coaching his Waldorf kids. So basically, creating a generation of grounded families with beautiful memories ;) He grew up in a musical-theater family, where he spent his childhood painting backdrops for plays & musicals, as well as playing guitar in the house-band. Nowadays, when he's not teaching geometry, art & coaching local Waldorf students, Brian loves performing a wide range of musical styles (blues, jazz, rock, pop, etc). He has played in various blues and rock bands over the past 15 years and 8 years ago began performing as a solo, instrumental acoustic act at events such as weddings, wine tastings, gallery openings, and private parties. He is teaching Art to teacher trainees, and also teaches (as well as coaches Varsity basketball) at the Sacramento Waldorf School. Summers often see Brian in China, Utah and California where he works with teachers, parents and students at various training centers. Brian will be teaching the G7 & G8 geometry courses. Caitlin Amajor is excited to bring her love of art and teaching to the Waldorfish community! As a Waldorf student growing up in a small Northern California town, Caitlin’s love and appreciation of artistic and experiential learning began at a young age. With the encouragement of her parents, Caitlin pursued her certificate in Waldorf teacher training after college, and has been teaching in the middle school grades as a class teacher for the last six years. While the list is long, some of her highlights of being a teacher are teaching geometry and physics, watercolor painting, and observing the many triumphs and successes of her beloved students. Caitlin enjoys discussing and expanding Waldorf pedagogy and how it can evolve in the modern world, and also has a wealth of knowledge (because of much trial and error!) around the practical elements of teaching on a day to day basis. 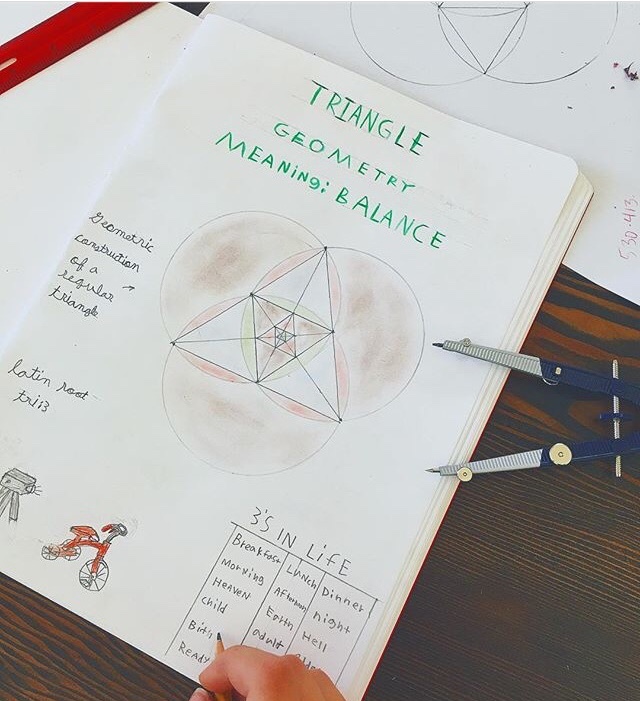 She offers helpful tips and observations from her own experience, and inspires others to explore the wide-ranging and artistic realm of geometry for the 5th and 6th grader! Beautiful student work! Click here to view more.